Who’s Coming Up on Monday, February 13? Who’s coming up on Monday February 13? The best laid plans of Mice and Men… etc. etc. etc. …are gone with the wind in the face of Mother Nature’s antics, or so it was with the EKK night reserved for Kalani Pe’a. Being the very professional musician that he is, he wanted the sound check at 4:00 pm, half hour after arrival on island, so the tech crew arrived at the hotel at 2:00 to set up the lights and sound system in plenty of time before Kalani and his Band arrived. Unbeknownst to anyone but Kalani’s manager and the EKK coordinator, the 3:25 arrival flight from Maui was delayed three times, supposedly arriving at 4:50, still in time for a 5:00 sound check, but for three musicians with tons of instruments and baggage to disembark is anything but a fast process. Finally, everyone piled into the EKK van which was luckily empty and dashed to KBR for a quick sound check from 5:30 to 6:00 pm. A long line of audience members were patiently waiting in the foyer for the program; luckily, they are not the complaining type. What caused all the drama? The freaky huge winds caused many flights out of Maui to be cancelled because no planes could land in Honolulu; luckily their direct flight to Kauai came through… very, very late, but still on the same day. Some folks involved in tonight’s EKK program managed to get the last flight out of Honolulu; all other flights cancelled. What a nail-biting way to start the program. Fortunately, the Father and Son team from Kamoa ‘Ukulele, Joe and Sam Bonanno, were scheduled to teach the ‘ukulele circle on this night. They taught Hawai’i Aloha which made a lot of players happy. Besides so generously donating the Kamoa ‘Ukulele to be given away each night at EKK, this gracious family showed up to take part in the program. How special is that? Ua ho?olohe au i kekahi k?k? kama?ilio ma ka leki? ?o KKCR i ka P? ?alima nei ma waena ?o ?Anak? Maria a me Kalani Pe?a. ? pau, ua hele au i ka hale waihona puke o K?loa a ua heluhelu wau i ka ?akikala ma ka n?pepa ?o ?Ka Wai Ola? e pili ana i?? ?Kalani Pe?a. Ma hope o ko?u ho?i ?ana mai i ka hale, ua ho?omaka au e hana i ka ha?awina ho?iho?i no ka?u papa ? ?lelo Hawai?i. Pono m?kou e heluhelu i ka mo?olelo ?o ?No Keoe? a ua makemake loa wau i n? kaha ki?i o loko, no laila, ua huli au i ka mea n?na i hana i ia mau kaha ki?i ?? AU?! ?O Kalani Pe?a kona inoa! I nehinei, ua pa?i ?ia kekahi ?akikala ma ka n?pepa ?o ?Garden Island? e pili ana i? ?.Kalani Pe?a!!! Lohe ?ia k?na mau mele ma n? wahi ? pau a ?ike ?ia kona maka i loko o n? makakina a me n? n?pepa n? ho?i. I ka l??ap?p? ana ?o ia e holo ai i Kaleponi no ka h? ?ike ?o ka ?Grammy?s? a ma laila ana e kau ai ka hano h?weo? E Kalani, kaulana n? ?oe ma MUA o kou komo ?ana aku i loko o ka Grammy?s! He pukani k?paianaha ?o ia a keu n? ho?i kona leo a ka nahenahe. E pa?ipa?i lima k?kou. ?O Kalani Pe?a k?ia! I listened to an interview on KKCR radio on Friday between Auntie Maria and Kalani Pe?a. After that, I went to K?loa Library and read an article in the newspaper ?Ka Wai Ola? about ?… Kalani Pe?a. After I went home, I started doing homework for my Hawaiian language class. We have to read the story ?No Keoe? and I liked the drawings very much, so I looked up the person who?d done those drawings?. WHOA! It was Kalani Pe?a! Yesterday an article was printed in the ?Garden Island? newspaper about?.Kalani Pe?a!!! His songs are heard everywhere and his face is in magazines and newspapers. Tomorrow is the day he?ll travel to California for the ?Grammy?s? where he has been placed in a position of glittering honor. Hey, Kalani, you?re famous even BEFORE you get to the Grammy?s! He?s an amazing singer and oh, how beautiful his voice and his easy going style. Let?s give him a warm welcome. Here?s Kalani Pe?a. So even before he set foot on this island, Kalani Pe’a has been making the news in more than one arena. We were so fortunate to have been able to schedule him, not knowing at the time of booking that he would have to be whisked away to LA early the next morning to participate at the Grammy Awards. He began the program in the traditional Hawaiian style with an Oli. His voice is high, his face is ever expressive, his words are beautifully articulated and he modulates verse after verse and adds to the story with his expressive hand motions. 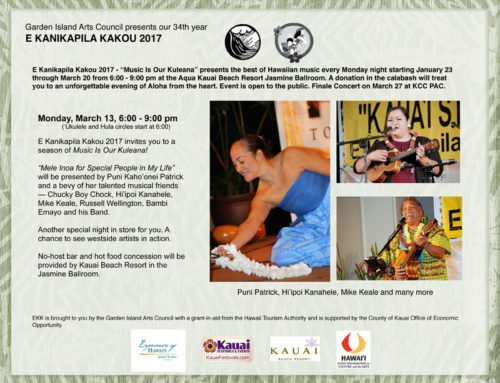 The rest of the program could be called a Kalani Pe’a style program all the way to the final Hawaii Aloha where he called his musician friends – Kamealoha Forrest, Waipuna Flores, Kellen and Lihau Paik of Kupaoa, his manager Allan B. Cool, Jodi Ascuena and myself to join him on stage, ever inclusive, ever exuberant, swinging and swaying and belting out the final song with so much aloha. Words seem inadequate to describe Kalani’s singing. It’s one of those experiences where one needs to be present to enjoy. It’s not only the powerful voice which soars at times, ripples out soft sweet melodies, croons and scats and teases and emits guttural sounds, but it’s also his unbridled exuberant personality which breaks out into a melodic monologue or an imitation of an unforgettable performance by some iconic singer from the past. He caresses the microphone with one hand and dances the hula with his other hand, he dances about, interacts with his bass player, and shares stories about the songs in Hawaiian or in English because he feels the stories are an important part of sharing the Hawaiian music. His mother is credited with much of his success. From his description she sounds like the ultimate stage mom determined to help her son overcome his childhood speech impediment by having him sing, sing, sing!!! According to Kalani, the pre-school “speech therapist” route did little to help him overcome his severe stammering and stuttering, but music theory and training, even singing karaoke, helped him to be able to master the words so he started to sing at an early age. His mom once lost him while shopping and found him serenading the mannequins at the JC Penney Store. “What the hell are you doing?” He was just training himself to sing and to win at the “Brown Bags to Stardom” at age 18. With his mother’s nurturing, he discovered early on that music was his life. His most recent accomplishment was his debut album, E Walea, which was nominated for a Grammy Award in the Best Regional Roots Album category. Coming from a family of musicians – a grandfather who was an opera singer, aunties and grandmother who sang, played the piano, harmonica and slack key guitar – is it any wonder that he stands today on the EKK stage, poised to take off to the Grammy Awards in the morning where he will be sharing with a much larger audience this whole Kalani Pe’a package, raised by a caring Mom to become all that he was meant to be. In the sweetest falsetto voice, he shared the song Ku’u Poli’ahu, a song he wrote for his mother sixteen years ago, for all the moms who care about raising their children. Kalani compares his mom to the Snow Goddess of Mauna Kea. He absolutely adores his exquisite mom, who even after four children and four grandchildren, looks like his sister. He was elated that his mom would join him on O’ahu to be at the Grammy Awards for his debut. Not sure if he really dug all his small-kid-time appearances but he went along with his mom when she took him to Woolworth’s to sing Disney’s A Whole New World dressed in an Aladdin outfit with instructions to dramatically draw his toy sword at the climactic part of the song and jump on his own private kalakoa Aladdin rug which she bought at Longs for $5.99. “Why?” he asked her, but he did it anyway and won a $25 gift certificate from Fun Factory. I think he rolled his eyes when he shared this story. He shared several Hawaiian songs. He Lei Aloha No Hilo, composed by Devon Kamealoha Forrest of Hanalei about the naupaka flowers that grow along the shorelines. Like people they need light and water to flourish and grow or they end up as a Pua Ting (poor thing). I never heard Noho Paipai, The Rocking Chair Song, sung quite the way he did, but his Dad’s jazz and gospel influence could be heard in his rendition. The message was to cherish your loved ones. The song He Wehi Aloha, which his sings as a duet with Nani Lim Yap on his album, is about the misty rains and lush beauty of Maunawili. He called up Kamealoha to do the hula. Maluaka is a song about the farmers of Keahou, Kona, where they harvest dryland kalo as their main staple. “I’ll be a farmer in this song,” he said, describing the planting of the kalo with their special tools as the birds tweet overhead. He describes the kolonahi wind which blow briskly through the bamboo forest under the mahealani moon. The song has such a catchy beat so all the volunteers standing at the back were moving and grooving to the beat. E Na Kini, composed by Ernest Kala of Kalaupapa, is the national anthem of Molokai “where families are together forever”. He sang it interactively with the audience, asking them to sing “lawe a lilo” when he sang “i ka lawa” and “pono a mau” when he sang “I ka pono”. Simple, but it took a few tries before the audience got it. He appears to be a very patient teacher. As we do each week before intermission, CD’s donated by various artists, were given away to many happy winners who took the time to fill in their attendance survey sheet. They included Pam Schaal of Colorado, Bill and Sarah Miller of Kentucky, Carol Sue and Ted Acres of California, Liz and Larry Kliman and Mary Oman of Canada, Devon Forrest of Hanalei and John Pia of Anahola. After the intermission, the lucky winner of the Kamoa ‘Ukulele was Lloyd Anderson of Gilbert, Arizona, who shared with me that earlier that day he had gone to Kamoa ‘Ukulele shop in Koloa and met Joe Bonanno. Kalani shared that he is often called “weird” by his students because he loves purple so much. In honor of coming to Kaua’i, he wore a purple tie and purple cap with his striking brown Sig Zane aloha shirt. Dressed appropriately for Kaua’i, he was joined in song by his musicians, Mark Vaught and Henry Koa, for Auntie Edith Kanaka’ole’s hula favorite from Hilo, Ka Uluwehi O Ke Kai. He invited any hula dancer to come up; Holly Namaka Lindsay from Minnesota bravely did the fast-paced hula, definitely one of her favorite dances. Another Hilo favorite is ‘Akaka Falls; it appears to be one of Kalani’s favorite songs as well as he used his operatic training to soar dramatically through the song. I don’t know how he did it but he sang You Are So Beautiful with piano accompaniment. Where did that come from? He followed with a medley of Al Green’s Let’s Stay Together and Smokey Robinson’s Ooh Baby Baby and stressed to the audience how important it was to enjoy each other’s company and to seek beauty in everything around us. For his last song, he sang acapella a hymn-like Nani A Maika’i in honor of his grandmother who passed away in 1977 at the age of 84. It brought everyone to their feet with hana hou! hana hou! He honored the request with Just My Imagination where a little bit of gospel creeped in. Gospel, jazz, soul, opera, Hawaiian, himeni, oli, scatting, doo-wop … he rolls it all together into his own Kalani Pe’a signature style singing. Besides his singing career, which seems to be taking off very swiftly, Kalani has a day job in the Hawaiian Culture Based Education Department at the Kamehameha Schools Maui where he creates Hawaiian-based science-based curriculum for grades 6 to 12. His drawings in the Hawaiian language anthology, Moku Ka Pawa, shows a very proficient artist, reflective of his highly personal take on life. He is also working on his masters degree at this time. More power to him! Kalani called his friends to the stage to join him in his Kalani Pe’a style Hawai’i Aloha. All joined hands for the favorite closing song which always gives everyone a positive lift as they bid each other a hui hou until the next Monday. Kalani definitely rubbed off on everyone as the powerful singing by the whole audience was tinkling all the icicle décor hanging from the light fixtures above. Comic Strippers from Canada bring laughter and just plain good fun to Kaua’i audience!